WASHINGTON — Julia Louis-Dreyfus is one of the best-known comedic actresses of her generation, and now she’s being recognized with the Mark Twain Prize for American Humor for a lifetime in comedy. She is the 21st person to be honored with the award by the Kennedy Center for the Performing Arts. Jerry Seinfeld, Stephen Colbert and 2010 Mark Twain recipient Tina Fey are among those offering testimonials to her talent. As celebrity guests arrived for the ceremony, Seinfeld recalled the first time he saw Louis-Dreyfus in action – and knew almost immediately she was a major talent. “The first time I really knew was when I stuffed raisins in my nose and my mother laughed. I ended up in the emergency room because they wouldn’t come out!” Louis-Dreyfus said. 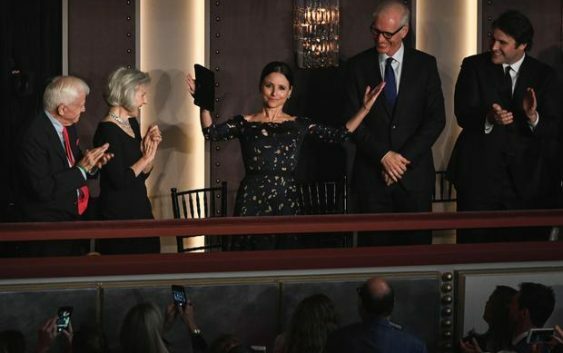 Julia Louis-Dreyfus (L) reacts as she arrives during the show for the 21st Annual Mark Twain Prize for American Humor at the Kennedy Center in Washington, D.C., on Sun., Oct. 21, 2018. Comedian and director Kumail Nanjiani grew up in Pakistan and never saw an episode of TV’s “Seinfeld” until he immigrated to the U.S as an adult. The 57-year-old Louis-Dreyfus emerged from Chicago’s famed Second City comedy troupe before joining the cast of “Saturday Night Live.” Her best-known role is her nine-year run as Elaine Benes on “Seinfeld.” More recently, her work as Vice President Selina Meyer on “Veep” earned her six consecutive Emmy Awards. Production on the upcoming seventh season of “Veep” was delayed as Louis-Dreyfus received treatment for breast cancer. Recently, Louis-Dreyfus appeared on Jimmy Kimmel’s late-night show, which had broadcast from Brooklyn last week.